Our face painters and ballons artists have over 8 years of experience working with children and will truly amaze you and the children at your event with their artistic ability. 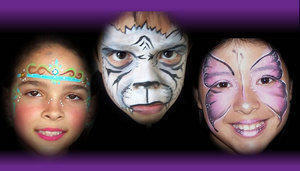 They use professional hypo-allergenic face painting materials. The complexity of design will be based upon the time you request and the amount of children participating. It is estimated to paint about 12-15 children for 1 hour. We highly recommnend you to request more time for full face design.